The PR-640 SpectraCal is a high precision spectroradiometer from Photo Research that offers a quick and affordable solution to intensity and colour quality problems. It is a hand-held illuminance meter/colourimeter that performs NIST-traceable measurements in seconds. Since the PR-640 makes photometric and colourimetric measurements spectrally, it has extremely high accuracy unmatched by any filter colourimeter. The battery-powered PR-640 captures the entire visible spectrum (380-780 nm) simultaneously under CMOS microcomputer control in near real-time. It has a compact, fast-scanning spectrometer with a concave holographic diffraction grating and a 128 element diode-array detector. Automatic Adaptive Sensitivity selects the optimal dynamic range based on the available signal. A specially designed cosine receptor eliminates errors caused by other measurement methods and collects light perpendicular to the optical axis of the instrument. This makes it possible to use the PR-640 for applications where it is not practical to point it directly at the light source. The PR-640 can be used in the Stand-Alone and Remote modes or with SpectraWin software. Since the PR-640 can be controlled remotely from a host computer, it is possible to completely automate all the measurements. What makes the PR-640 ideal for Projection System Testing? In order to meet ever tightening brightness and colour specifications, Projection System manufacturers have to measure the intensity, contrast and colour of their Displays and Screens. 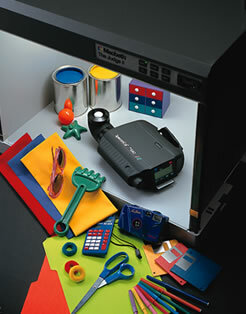 Typically, illuminance, chromaticity and CCT are measured at various spots to characterise the uniformity of products. The user-friendly PR-640 is the perfect instrument for this application because of its portability, high accuracy and rock-solid repeatability. Laser-based projectors and LCD projectors with metal-halide sources have spectra with narrow peaks and it is impossible to measure them accurately with a low cost filter colourimeter. The PR-640 offers the reliable performance of a spectroradiometer to make these measurements. The NAPM IT7.288 (National Association of Photographic Manufacturers) standard adopted by ANSI and EIAJ (Electronic Industry Association of Japan) for Projection System Measurements recommend a spectroradiometer like the PR-640 to perform colour measurements. Most filter colourimeters perform accurate colour measurements only when they measure broadband sources that are spectrally similar to the light source used to calibrate the colourimeter. Errors are introduced when the measured spectrum has a lot of energy in a region where the instrument's filters differ from the theoretical 1931 CIE colour matching functions. This makes it difficult to specify the colour accuracy of a filter colourimeter for different types of spectra. The filters may degrade over time and this further decreases the accuracy of measurements. On the other hand, a spectroradiometer like the PR-640 measures the complete Spectral Power Distribution of a source and calculates tristimulus values X, Y, and Z by integrating the spectral data mathematically with the 1931 CIE colour matching functions. The calculated tristimulus values are then used to compute Illuminance, CIE chromaticity coordinates and Correlated Colour Temperature (CCT) which provide a complete description of the source. There are no errors due to filter inaccuracies and therefore, the PR-640 has high accuracy and rock-solid repeatability over a wide range of CCTs (200K - 7000K) for any kind of spectrum. NIST Traceable calibration certified for 1 year. RS-232 Interface for Data Transfer, Printing and Remote Host Control. Backlit LCD display for data viewing. Storage and recall of 150 data files. Optional, Windows based SpectraWin software for data analysis, display of CIE charts and Spectral Power Distributions. Optional AC Adapter and Rapid Charger. NiCad rechargeable battery (minimum 2 hours continuous operation). AC and DC adapters optional.